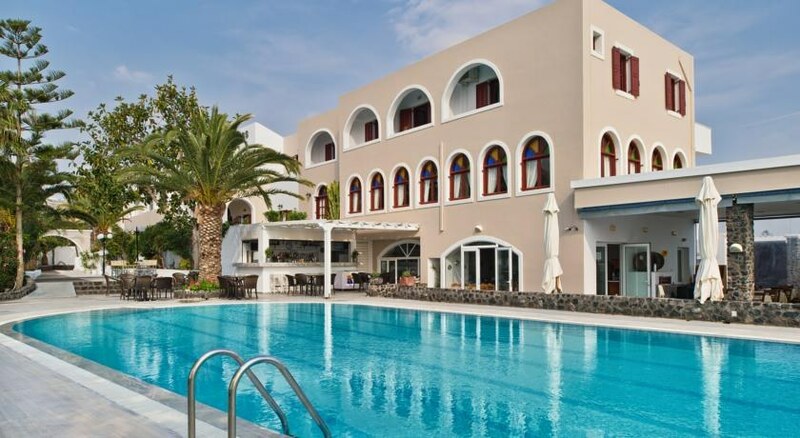 The Hotel Makarios is a luxury, family-friendly hotel, which was established over 30 years ago, in Kamari, Santorini island, Greece. The hotel is located 350m away from the popular Kamari beach. Both children and adults can take a refreshing dip and have splashtastic fun at the two beautiful outdoor swimming pools,. The onsite restaurant offers American breakfast buffet to its guest. 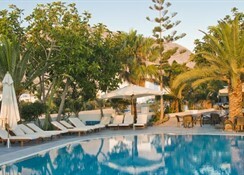 The hotel also houses a beautiful pool bar on its premises. The hotel has 64 beautifully-decorated guestrooms featuring a fusion of Greek and modern architecture with prominent bright colours. The proximity of the hotel to one of the most popular beaches of island and the town of Kamari makes it an ideal destination for vacationers who wish to have a sunny beach vacation, exploring Greece. 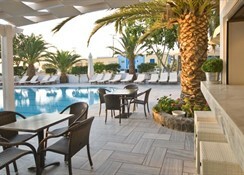 The Hotel Makarios is located 4.8km away from the Santorini Airport. The nearest beach, Kamari beach, is 350m away. The town of Kamari is 1km away from the property. The island’s capital city Fira is located 8.9km away from the hotel. The nearest bus station is 1.2km away. Popular tourist attractions and local landmarks like Art Space Santorini, Ancient Thera, Monolithos Beach, Santorini Water Park, Santorini Port, Museum of Prehistoric Thera, Archaeological Museum of Thera, Megaro Gyzi, Volcano, Archaeological Site of Akrotiri, Skaros, Red Beach, White Beach, Cape Columbo Beach and Naval Museum of Oia are located within a distance range of 13km from the hotel. The Hotel Makarios has 64 tastefully-decorated guestrooms which feature a fusion of Greek and modern architecture with bright colours. The guestrooms are constantly renovated to keep with the trends. The rooms are further categorised into three types based on amenities, space and number of guests accommodating the room. Double Rooms, Triple Rooms and Family Rooms are the types of rooms available at the hotel. The guestrooms are equipped with essential amenities and facilities like air conditioning, free Wi-Fi, satellite TV, radio, refrigerator, hair dryer, direct dial phone, safety deposit box, shower or bathtub, essential toiletries, etc. 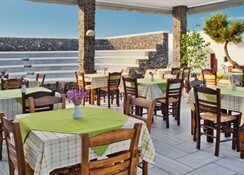 The Hotel Makarios houses a bar and restaurant on its premises. The restaurant serves American breakfast buffet along with various snacks and dishes of local Greek and wide range of international cuisines. The bar, which is located by the pool, serves local wines, beers, signature cocktails, alcoholic and non-alcoholic beverages. The guests can also try restaurants, bars and traditional taverns at the popular Kamari Beach or the Kamari town, which are quite close to the hotel. The Hotel Makarios houses two beautiful outdoor swimming pools for both adults and children. This serves as an excellent spot for recreational activities like mild pool games and refreshing swim. There is a poolside bar for the guests to relish some refreshing beverages. 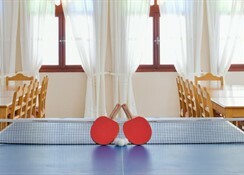 The hotel has facilities for tennis sessions and playground for children on its premises. The guests can also try water sports at the Kamari Beach or indulge in leisurely sunbathing. Guests can indulge in sightseeing, shopping, among others, at the Kamari Beach.